Want more online sales from international customers? Seize the opportunity to sell to customers around the world! No business can avoid digital disruption. You either adapt, embrace it and then use it to your advantage, or you will get outpaced by a competitor that does. The time to act is now, so that you won’t get left behind. The internet has opened up the doors of international trade to everyone. You too can sell to millions of customers all over the world. Barriers are down, margins are up and unstoppable international digital growth is a reality. 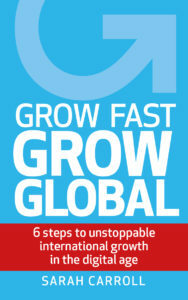 The way to GROW FAST is to GROW GLOBAL. But in this new uncharted territory, where do you start? Many businesses take a haphazard or reactive approach and so waste precious time and money. Avoid their mistakes, get it right first time and fast track your growth with Sarah Carroll’s fail-safe system. She has honed this method over 10 years of growing businesses just like yours. Sarah’s game-changing 6-step method shows you exactly what you need to do to achieve long-term, profitable international growth. It’s not just about building an international website. You also need to take a strategic approach to the whole process and get into the right mindset before you can identify the right opportunities to build sustainable results. Each step has been carefully broken down with activities to keep you focussed and guide you through your own international digital growth journey. Find your way through the digital maze from Google to Baidu, from Amazon to Tmall and Facebook to WeChat. This book can supercharge the growth of businesses of all sizes and sectors. Whether you sell products or services, or sell to consumers or businesses, are a start up or an established company, work in fashion or finance, manufacturing or media – you are only 6 steps away from achieving unstoppable international growth. Sarah Carroll is a world-leading expert on how to grow a business globally using digital strategies. Called a ‘digital guru’ and even ‘digital royalty’, Sarah is founder of Grow Global and a self-proclaimed international enthusiast. She’s propelled over 5,000 companies on their international digital journey and helped them to achieve up to 10x growth, by translating her depth of knowledge of digital trade into simple, clear action to follow.